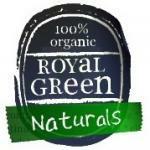 Royal Green Astaxanthin is grown in a clean environment in Hawaii and is 100% vegetable based. 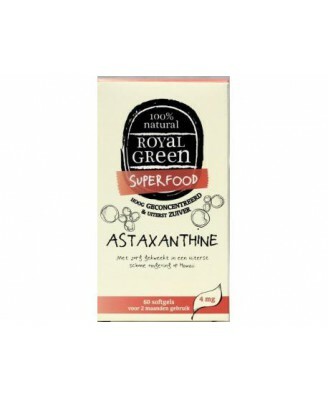 Royal Green Astaxanthin is grown in a clean environment in Hawaii and is 100% vegetable based. Astaxanthin belongs to the carotenoid family and is one of the most powerful antioxidants available. It is 64 times stronger as an antioxidant than vitamin C. Astaxanthin also supports the condition of your joints, skin and circulation. 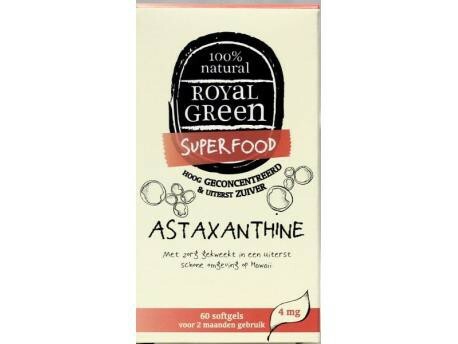 No Chemicals, No Preservatives, No Synthetic Sweeteners, No Flavour Enhancers, Naturally Gluten-Free, King of the Superfoods, 100% Natural Astaxanthin, Free From Pesticides. 1 Astaxanthin capsule per day, preferably with a meal.